A menu from The New England Economical Housekeeper by Esther Allen Howland. Happy Thanksgiving, everyone! Enjoy the holiday weekend. Events: A Revolutionary Thanksgiving Photos! If you took any photos at the event, please add them to the Revolutionary Thanksgiving group here. I want to stick my face in it. The most recent issue of Martha Stewart’s Food magazine contains an abomination: a recipe for Green Bean Casserole in which all of the components are made from scratch. Shallots are hand-breaded and pan-fried. Mushrooms are seasoned and sauteed in cream. Ridiculous! My mom and I got into a heated debate over the legitimacy of this recipe. Mom thought it might be good; I conceded that it might. However, this recipe takes a dish that was designed to be extraordinarily simple and makes it incredibly complicated! I say don’t fix what ain’t broke. 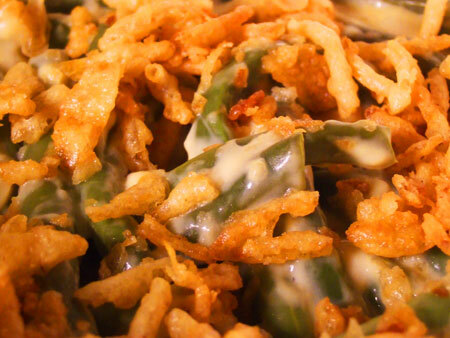 Green Bean Casserole was created in the 1950’s during an era of canned convenience food. It has survived as a traditional Thanksgiving side dish not only because of its simplicity, but because it happens to be delicious. “Deemed the ‘mother of comfort food,’Dorcas Reilly led the team that created the Green Bean Casserole in 1955, while working as a staff member in the Home Economics department of the Campbell Soup Company. …She says the inspiration for the Green Bean Casserole was to create a quick and easy recipe around two things most Americans always had on hand in the 1950s: green beans and Campbell’s Cream of Mushroom Soup. Like all great recipes, the casserole requires minimal number of ingredients (just five), doesn’t take much time, and can be customized to fit a wide range of tastes. Dorcas Reilly scooping out casserole at the Inventors’ Hall of Fame. This Thanksgiving, reenact a tiny bit of American history, and make the classic Campbell’s Green Bean Casserole. 1. Stir the soup, milk, soy sauce, black pepper, beans and 2/3 cup onions in a 1 1/2-quart casserole. Liza di Guia, a local food journalist, recently shot a short documentary about my work–and here it is! This is my first experience with being on camera, so I am simultaneously horrified and delighted. And if you like what you see here, come see more in person at the Old Stone House in Brooklyn! On Sunday, November 22nd, from 12-3, I’m going to be cooking an entire Thanksgiving dinner over the hearth. Stop by to tour the museum, chat, and get some free tastes of what’s cooking. More information soon…in the meantime, please enjoy the video! Read more about Sarah and her projects in her blog http://www.fourpoundsflour.com. You are gonna love this torte. I first heard about the Huguenot Torte when paging through my most recent issue of Cuisine at Home. The photos promised a luscious-looking apple and pecan treat, that “…Hails from the Ozarks, but was popularized in South Carolina by French Protestant immigrants known as the Huguenots.” An apple dessert that also has a historical provenance? Excellent. As it turns out, this dish had little to do with the Huguenots, and nothing at all to do with our eigth president. I don’t hold the untruths that have been propagated about the Torte against it, because in actuality, this torte is one of the most amazing desserts I’ve ever had. 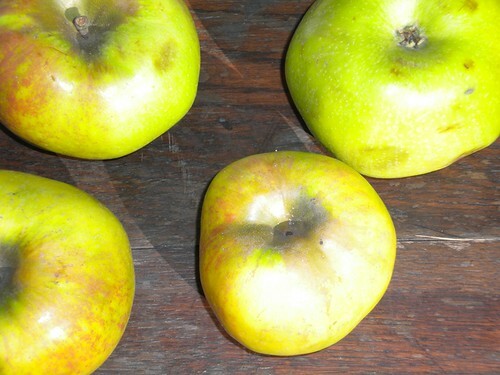 It takes advantage of the fall apple harvest and is incredibly simple to put together. It has very little flour and a lot of eggs and sugar, which results in the most fascinating texture combination after it is baked: the top is the crustiest, crispiest meringue, while the inside is gooey, buttery caramel. This dessert is astounding and due for a revival; in fact, I bet Martin van Buren would have loved it, had he been alive when it was created. 1 cup heavy cream, whipped with 2 tablespoons sugar and 1 teaspoon almond extract. 1. Preheat over to 325 degrees. Grease a 9 x 13 inch baking dish; or line it with parchment paper. 2. Beats eggs and vanilla at high speed. Add the sugar a little at a time, until the eggs are light and creamy, about five minutes. 3. Whisk together flour, baking powder, and salt. 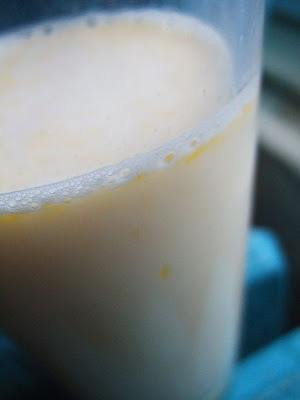 Mix into egg mixture until just combined. 4. Fold in apple and pecans. 5. Pour into baking dish. Baked torte 35-45 minutes, until the top is golden brown. Cool five minutes and serve warm, cut into squares. Don’t get stressed out when the Torte crumbles as it is dished out; that’s its nature. A dollop of lightly sweetened, almond flavored whipped cream is an excellent compliment. This Torte tastes even better the next day, after being warmed a few minutes in the oven.